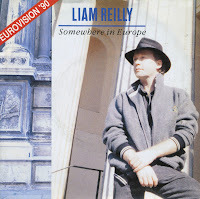 Liam Reilly represented Ireland during the 1990 Eurovision Song Contest with 'Somewhere in Europe', a slightly contrived song in which the singer describes his desire to meet a former lover once again. As he is 'back in Ireland', he wants to meet his lover somewhere in Europe. All the cliches about European capitals are subsequently described. Still, this array of cliches pleased the European juries, as the song finished second behind that year's winner, the appalling 'Insieme 1992' by Toto Cotugno.